Baron de Morpurgo was Italy’s number one ranked tennis player in 1927 and in 1929 through 1931. He was ranked in the World’s Top Ten 1928 through 1930—ninth in 1928, tenth in 1929, and eighth in 1930. 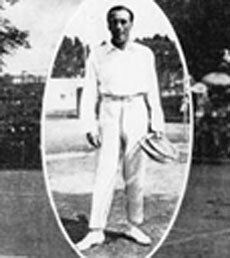 American tennis icon Bill Tilden ranked him sixth in the World in 1929. At the 1924 Olympic Games, de Morpurgo defeated France’s Jean Borotra, the reigning Wimbledon Singles Champion, to win the bronze medal. He was a member of Italy’s first-ever Davis Cup team in 1922 and played on every Italian Davis Cup team through 1933. The American Tennis magazine labeled Baron de Morpurgo “the Tilden of his country.” In 1929, the Baron was named Italian Commissioner of Tennis by Benito Mussolini.